The promise of this passage is simple enough: The nation of Israel is sacred in God’s eyes. His blessings have preserved the Jewish people through destruction and disaster countless times over the centuries. He has blessed the nation and its people, and He has promised to bless those who uphold the Jewish nation and to curse those who harm His chosen people. Evangelical Christians believe this to be one of the most fundamental promises of Scripture. But not everyone agrees. Today’s opening of the U.S. Embassy in Jerusalem came with mass protests yesterday along the Israel border, casting a cloud over the event. The Trump administration’s decision to recognize Jerusalem as the capital was heralded by many pro-Israel activists but decried by Palestinians and America’s Arab allies, Fox News reported. President Trump had long planned a greater and more supportive relationship between Israel and the U.S.—months before the 2016 election. Trump’s support for Israel was just one reason Christians rallied around him. The Jewish minority in America exists in a different category from other ethnic groups, and Jews occupy a special place in Christian theology. There has been a substantial bedrock of support for Israel among evangelical Christians since the modern nation was established in 1948, but the Hebrew roots of both Christianity and Judaism are as ancient as the Bible itself. Despite this country’s connections with the nation of Israel, America’s support was seriously eroded under President Obama. Liberal Christians tend to favor the Palestinian cause, but most evangelicals were horrified by the disparaging remarks the former president made to and about Israeli Prime Minister Benjamin Netanyahu. The Trump administration’s actions in Israel have been decisive thus far in the presidency. 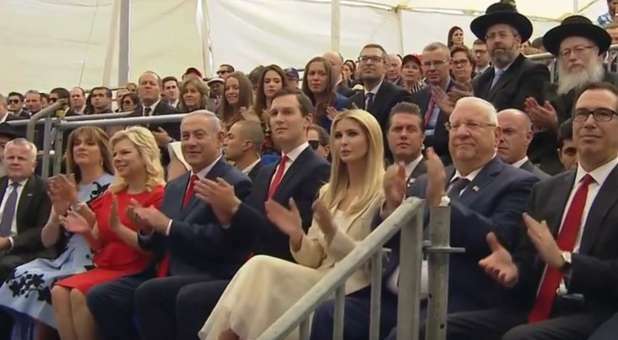 For example, last May, Vice President Mike Pence invited about 100 rabbis, Israeli diplomats, a few congressmen and about 30 evangelicals to the White House to celebrate Israel’s 2017 Day of Independence. This was a public decree that as long as this administration was in place, Israel would be America’s best friend—and the U.S. would be Israel’s. Trump also did what no other sitting U.S. president had ever done before. While in Jerusalem, Trump visited the Western Wall of the Temple Mount, standing at the holiest place where Jews are permitted to pray. He said a few words before inserting a note between the stones. The president later said he prayed for wisdom as he reached out and touched the walls. Trump has been clear about his support for Israel. In an interview with the Israeli newspaper Israel Hayom, published Feb. 26, 2016, Trump said, ‘My friendship with Israel is stronger than any other candidate’s.’ When asked about his plans regarding a possible compromise agreement with the Palestinians, he said that peace between the two is not only paramount, but possible. He also stated long before his election that he wished to move the U.S. embassy from Tel Aviv to Jerusalem and added that the Obama administration’s nuclear deal with Iran is the ‘worst deal that Israel could have gotten.’ Today, both of his goals for the capital and the Iran deal are reality. Be sure to read my book God and Donald Trump and get an inside look at the Donald Trump campaign, election and the presidency, including how he engaged with evangelicals and other faith groups to claim victory.